to make the base, sift flour into bowl. Rub in butter finely. Add hazelnuts and 1 oz icing sugar. Mix to stiff paste with egg. Wrap in foil and refrigerate for 15 minutes. Turn out onto floured surface and roll into 8 inch round base. Transfer to baking tray and bake in center of oven for approx 15 minutes or until golden brown. Remove from oven and transfer to wire cooling rack. Spread with jam when cold. reduce oven to moderate temperature of 350 F.
To make cakes brush two 8 inch baking tins with melted butter and line with greaseproof paper. Sift together self raising flour and cocoa powder. Cream butter with brown sugar and essence until light and fluffy. Beat eggs, one at a time, adding a tablespoon of sieved dry ingredients with each. Fold in rest of dry ingredients with metal spoon then transfer to prepared tins. Bake in center of oven for 25-30 minutes or until firm and well-risen. Turn out onto wire cooling rack and remove greaseproof paper. Moisten cakes with two tablespoons syrup from can of cherries mixed with the brandy. Leave until completely cold. Halve cherries and remove pits. Drain thoroughly. Beat cream and sugar together until thick. divide into two portions and flavor one with coffee. Sandwich cake together with the plain portion of the whipped cream and the canned cherries.Place on top of jam covered base. To make chocolate butter cream, mix cocoa to a smooth paste with boiling water and leave until completely cold. Beat butter and remaining icing sugar to a light and fluffy cream. Gradually beat in cooled cocoa and vanilla essence. Cover top and sides of cake with butter cream and press grated chocolate against the sides. 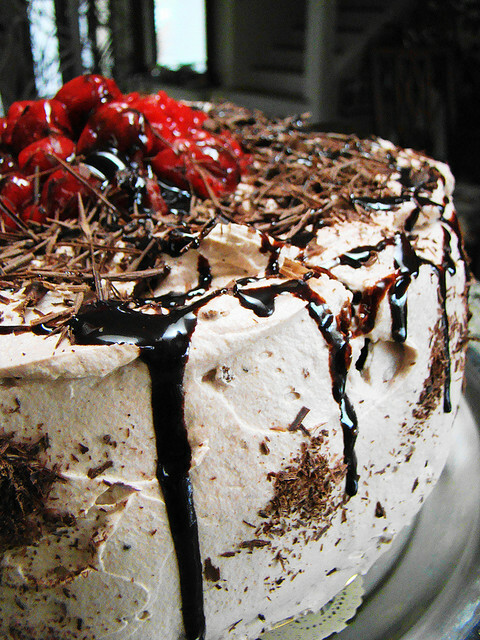 Pipe whirls of whipped coffee cream on top of cake then decorate with cherries and walnut halves. I love my baking cakes, biscuits, pudding etc.